Holy Trinity church in Southport certainly has a 'wow' factor especially when , as on Sunday, the impressive architecture is combined with excellent music, a well ordered service and a thought provoking sermon. 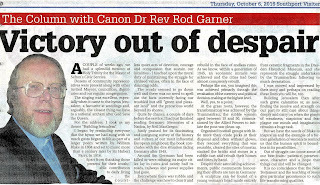 Rod Garner and his team gave substance to the psalmist plea to 'worship the Lord in the beauty of holiness'. The church was packed and we ran out of service sheets. 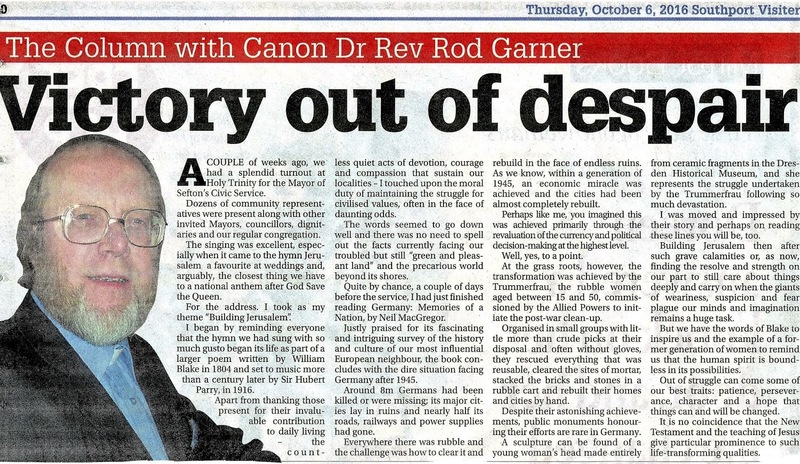 It was good to see so many people attend from the groups that I have visited since I became Mayor in May. In addition to civic colleagues (including the High Sheriff) I was particularly delighted to see so many people from Birkdale who have supported me over many years. The congregation played their full part especially in the hymn sing especially William Blake's Jerusalem, which was the focus of the sermon, with its urgent questioning of whether a new Jerusalem would be build in England'd green and pleasant. lands. I have had some really excellent feedback from those who attending describing the services as 'beautiful, uplifting and inspiring'. 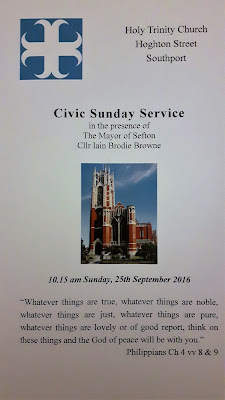 My sincere thanks to everyone at Trinity for all their hard work and preparation which ensured the Civic Service was a memorable occasion.